MONTROYAL IS LOOKING FOR PARENT LEADERS! As parents, the opportunity to volunteer in our school community is priceless, and everyone, especially our kids, benefit! There are several volunteer openings on the PAC Executive for the 2016/2017 school year; there are also some committees that can use your help! Early Bird Tickets still available until April 1, no joke! You are all invited to Montroyal's fundraiser. A great fun night out with a goal of raising $20,000 towards new classroom laptops. Bring your friends and family. Login to montroyal.hotlunches.net to get your Early Bird tickets! Cannot make the party? Please consider donating. Check out more details HERE. For more information or to get involved as a volunteer or sponsor, please contact Tanis Fritz or Bernadette Dunnigan. 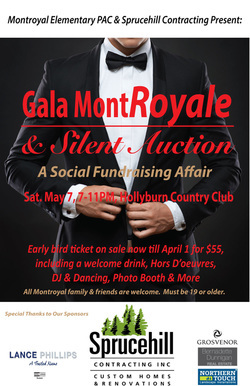 All students and parents are invited to contribute to the Gala MontRoyale Silent Auction and Stock the Bar Raffle. The Division with the highest percentage of class participation will win a Pizza Party! Click ﻿HERE﻿ for more details on how you can contribute. 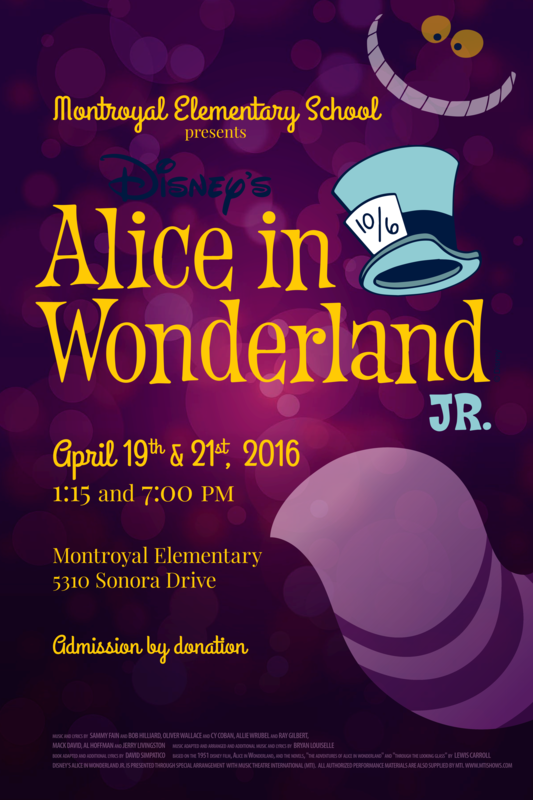 Save the Date - Alice in Wonderland Jr. Please see letter from Mrs Hill for intermediate parents to help volunteer for this event, Divisions 1, 2, 3 & 4. Click here. Please email Yvette Scott yscott85@gmail.com if you would like to assist with anything to do with costumes & make up. Please email Mrs Hill jhill@sd44.ca for assistance with sets, props, lighting, sound, equipment set up & take down. Please refer to attached letter from Mrs Hill for specific details. "Sparking Imaginative Learning" runs on Fridays @ 3:10-4:10pm from April 1 - May 13 for Grades K-7. View more details on our Programs & Events page. New Art Mania Class start after Spring Break! K-7, Tuesday April 5-June 14, 12-1pm. See more details on our Program & Events page. Classes start the week of April 5, 2016. Visit Artists for Kids to register online. Spring Break? Neighbourhood Musical? After school program? The G7’s will be presenting Frosty Friday treats courtesy of TCBY on 8 Fridays during the spring for a fun treat to look forward to. Ordering will take place through montroyal.hotlunches.net. Further details to follow after spring break on how to order. Funds received go towards end of year celebrations for G7’s Graduation. Click on the icon below and login. Select “ORDERS” tab. Under “Hot Lunch - Session 2” section, click “Order” and follow directions.